It’s both a tribute to and a deconstruction of the Fab Four’s famous concept album, its songs reimagined into a rich score replete with crashing dissonance, stately harpsichord passages and theremin warbles. The costumes alone are an endorphin-producing, Mod-inspired delight, a retro dream in polyester for any human magpie with a penchant for bright colours and peter-pan collars – magenta shift dresses, orange miniskirts, spiffy Carnaby Street suits and turtleneck tops in rainbow shades. Excellently-clad, Morris’ dancers move easily through a mix of baroque posturing and 1960s social bopping – with gleeful snatches of the twist, mashed potato and hitch-hike sewn seamlessly into fleet balletic sequences. It’s lovely to see hints of Frederick Ashton in the plush inclinations of the upper body, expressive wrists and terre-a-terre footwork. 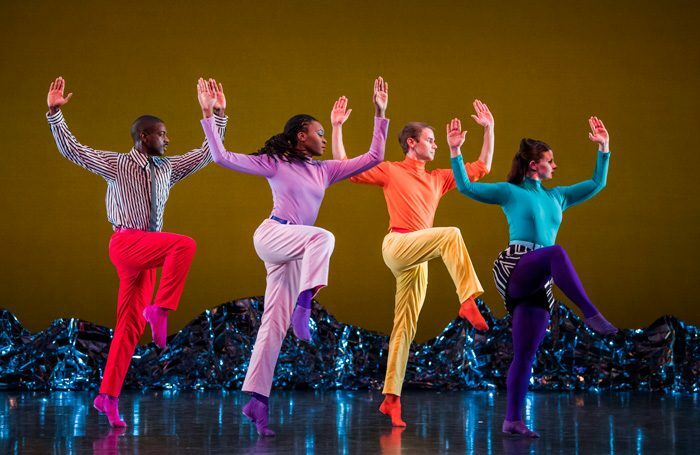 Music and movement come together superbly for the reinvention of When I’m Sixty-Four, the dancers forming a kicking, shimmying chorus line whose routine breaks into counterpoint sections in response to the competing lines of Iverson’s score. Elsewhere, there’s radiant simplicity and romance – a joyful lift of one man by another, or the concentric whirl of a duet for two female dancers that culminates in a statuesque frieze. Morris’ mastery of patterning is such that the stage is always alive, crackling with cleverness and finely-tuned kinetic energy.